There are so many things to love about this time of year. 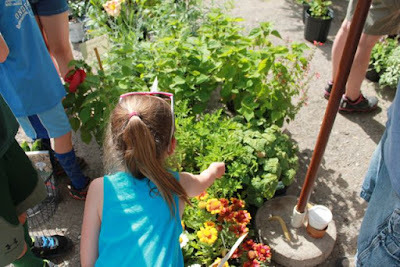 Cooking on the grill and eating outside, backyard campfires, slip n' slides and water balloon fights, catching lightning bugs, watching our butterfly garden come alive with flowers, and berry picking, especially blueberries. 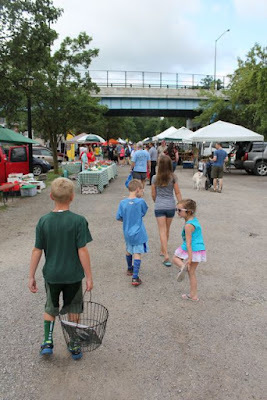 All of these things make my family very happy and after this week we can add shopping at farmers' markets to the list of happy summertime activities thanks to Nikki McClure's To Market, To Market. 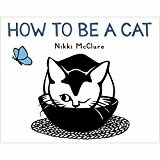 Nikki McClure is the illustrator of over ten books for children including Mama is it Summer, Yet?, Waiting for High Tide, and How to Be a Cat. As a child growing up in Washington state, Nikki enjoyed exploring nature and drawing "intricate and detailed" pictures in her sketchbook and by middle school she wanted to become a marine biologist. (We Make). Later, at Evergreen State College, while studying natural history, she continued to draw her observations whether in the field or looking through a microscope. Nikki explained her excitement for nature, "Every week I wanted to be a different scientist." (Cooper Point Journal). After graduating, Nikki worked for the Department of Ecology, but realized field work wasn't for her. She was becoming more intrigued with drawing not just for herself but for other people. "Word had gone around the hallways that I could draw ducks and cattails pretty well, so people would ask me to come in and draw a duck for their organization, or a cat, etc." After just one year, she decided to become an artist. (Powell's Books). At the Mazza Museum Fall Conference 2016 Nikki McClure said, "My childhood art was the extent of my art training." 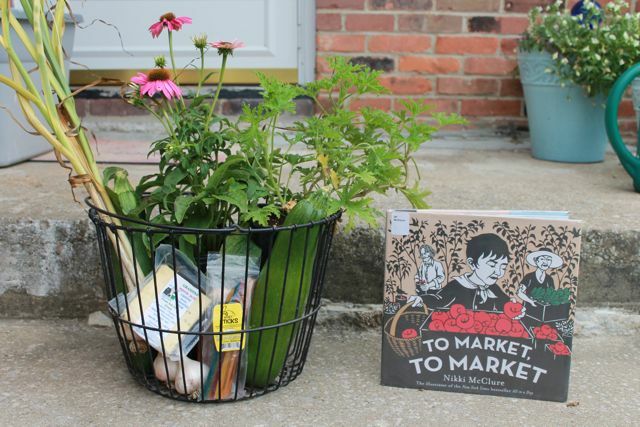 But, Nikki was determined to become an artist and made a deal with herself that she had to make some money each day even if it was "just a dime found in the parking lot." This arrangement with herself went on for a few years while she was trying to find her art style. 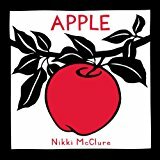 In 1996 a friend suggested that she try cutting paper and her first attempts became a self-published book Apple (which was later traditionally published in 2012). Then, as she continued to make handmade, self-published books illustrated with cut paper she also self-published a yearly calendar. After many years, the calendar caught the eye of the traditional publishing world and led to Collect Raindrops: The Seasons Gathered which was a collection of the artwork from her calendars. 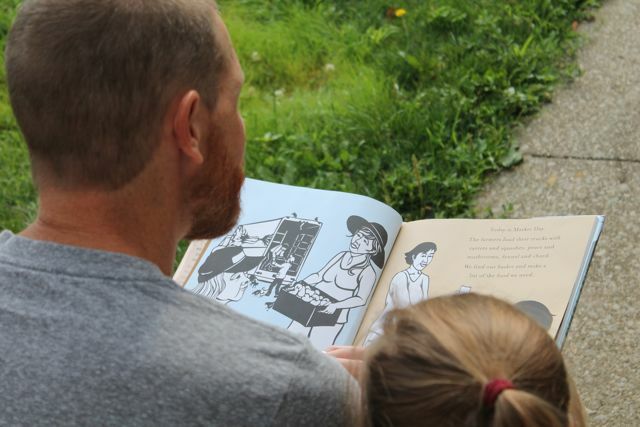 Then in 2009, she published All in a Day by Cynthia Rylant and her career as a book maker took off. (Seven Impossible Things). 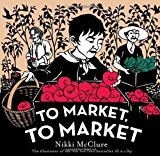 After reading many of Nikki's books I decided my favorite was To Market, To Market. I loved the pace of the book. It starts like a normal picture book with a few sentences on each page. "Today is Market Day. We hear the bell ringing. Everyone is gathering. The whole town is here." A little boy and his mom are ready to buy everything on their list at the farmers' market. Then, with each item on the list, Nikki quickly introduces the reader to someone at the market before giving a detailed description of how their item came to be available to the little boy and his mother. At end of the description, the person is thanked for the item. "Thank you, Jessie and James, for this juicy, oozy blueberry turnover." I loved it. 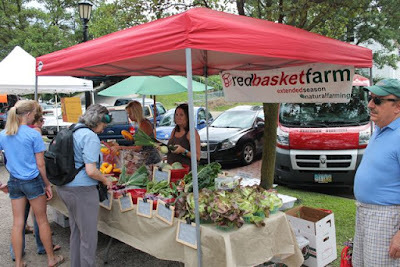 I thought it would be fun for my family to visit a farmers' market, meet the farmers, growers, makers, and providers. I wanted to learn their names just like I learned the people's names in To Market, To Market. I wanted to thank them for providing us with good things to buy. Reading the words "Today is Market Day," meant something more because it really was Market Day. 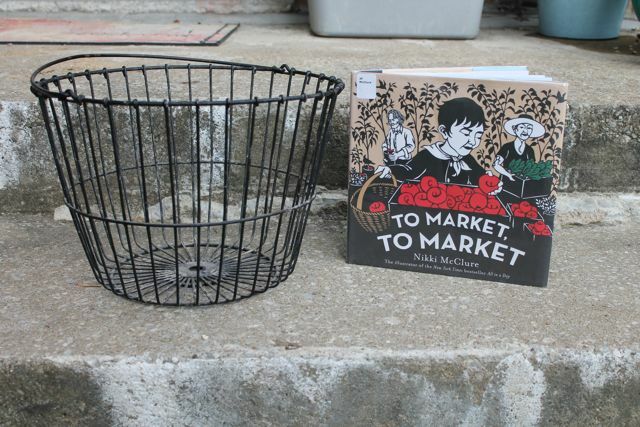 Our basket was ready to fill with goodies. 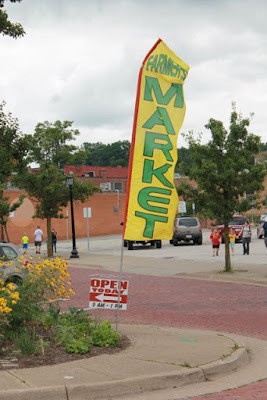 We drove to Kent, Ohio to Haymaker Farmers' Market which is celebrating its 25th anniversary. They were on a mission. I told them, "You can pick one item of your choice to buy." 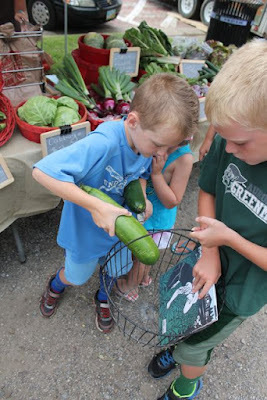 My youngest son decided right away that he wanted to buy zucchinis to make zucchini bread. He chose to buy two zucchinis from Amy at Red Basket Farm. Amy was nice enough to invite us to visit her farm! Thank you, Amy for your delicious zucchini. We made the bread when we got home and it was yummy! My youngest daughter saw all these plants from Klettlinger Greenhouse and wanted to get a flower. She chose a pink Pow Wow Coneflower. Gary encouraged all of my children to touch this plant and smell their fingers. It was a mosquito plant which smells like citronella. We bought one of those too. 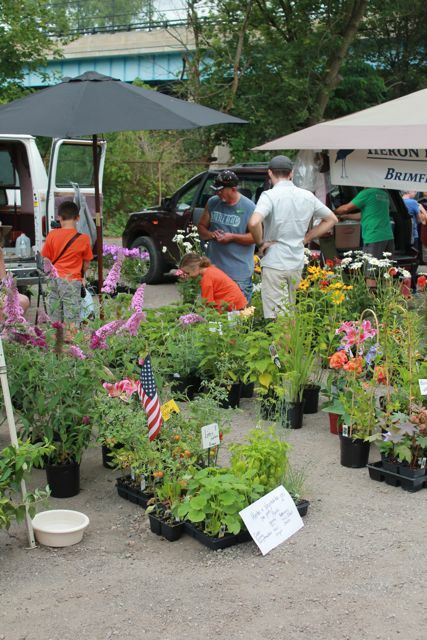 Thank you, Gary and Lisa for your wonderful plants. 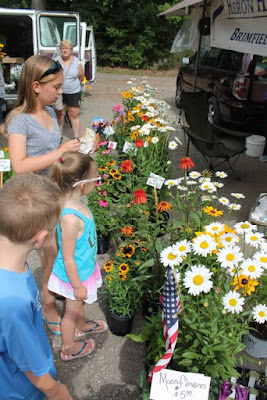 The coneflower is now in our butterfly garden and the mosquito plant is on our deck in a big pot. 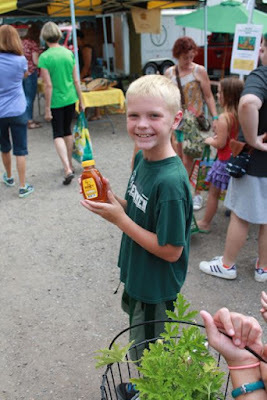 My oldest son saw this booth and wanted to get some local honey. Matt from Kline Honey Bee Farm answered all our questions including, "How many hives do you have?" His answer, "250 in Portage County." He chose the summer honey variety and is looking forward to having it on butter toast. 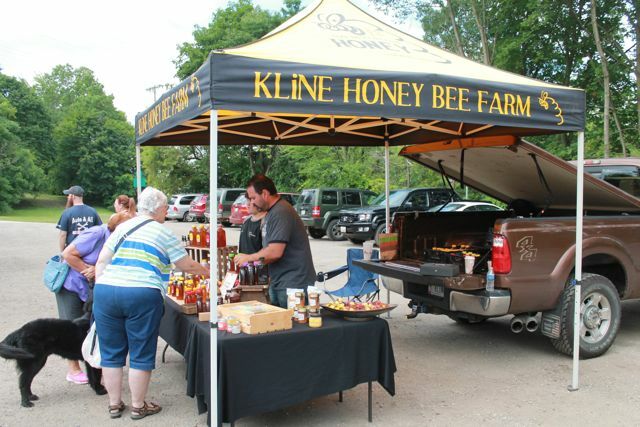 Thank you, Matt for the local honey. And for the honey sticks. 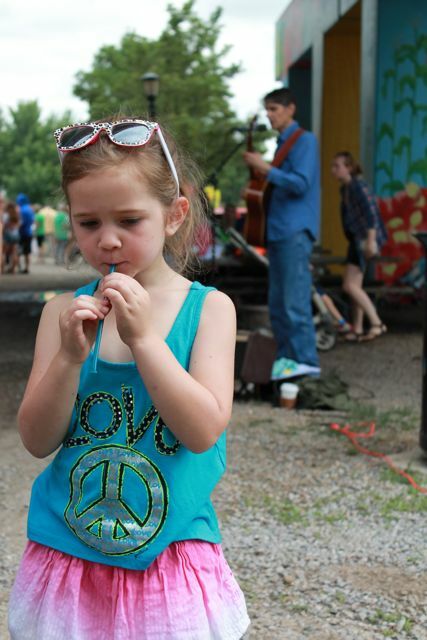 They were a perfect snack as we listened to some good music! My daughter tried a sample of cheese from Mark Grogan of Ohio Farm Direct the first time she passed by and it tasted so good that she returned to make a purchase. 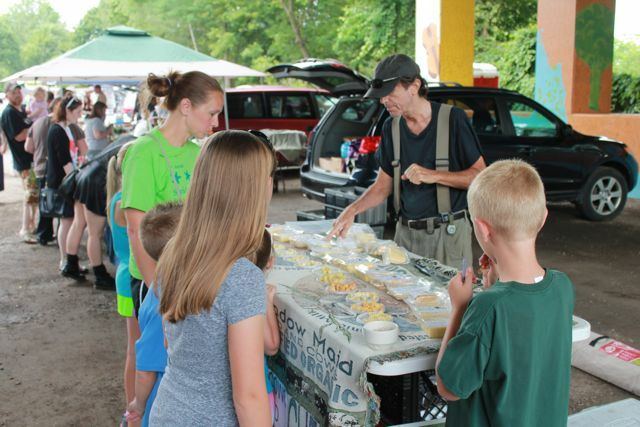 Thank you, Mark for the pepper jack cheese that was made from the milk of grass-fed cows. 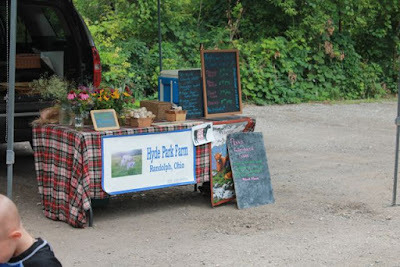 We grabbed three heads of garlic from Paula at Hyde Park Farm. Thank you, Paula for the garlic. It helped make the pesto pasta we had for dinner taste great! What did I choose? 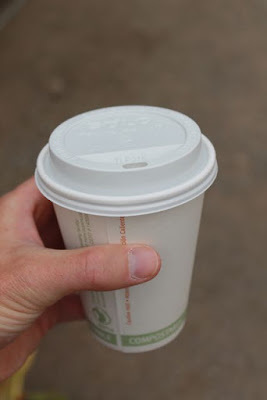 A cup of coffee from Carter at KC and Family Coffee Company. Thank you, Carter your coffee was perfect for my drive back home. Our basket was full. Market Day is done. Today I learned how important it is to introduce myself to, converse with, and thank the people that made it possible for us to have beautiful and delicious things. Every provider was so eager to answer our questions and to make sure we were happy with our purchase. Well, before I go, I think there is one more person I need to thank. 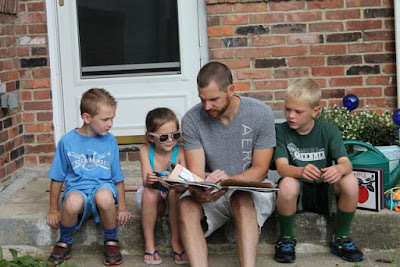 Nikki, thank you for making books for me to read to my children. We love them! It was a pleasure meeting you at the Mazza Museum and we thank you for sharing your birthday with us. We hope you have a wonderful day!